The lovely town of Gosau is situated in the Salzkammergut region, surrounded by UNESCO town Hallstatt, the stunning Hallstättersee lake and the Dachstein mountains with its wide range of skiing possibilities. In the centre of the town you'll find this magnificent hotel and apartment complex. 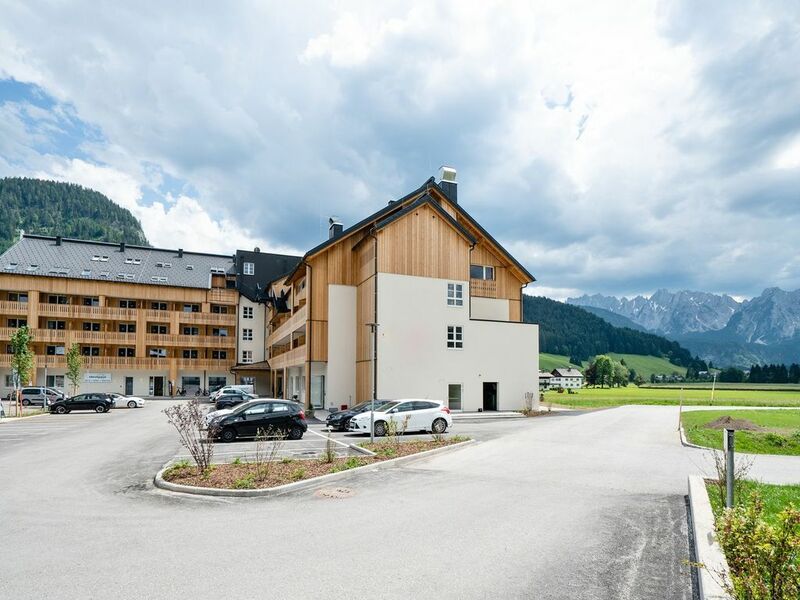 Famous skiers Hermann Maier and Rainer Schönfelder contributed to the design of this fabulous accommodation. Apartment guests can make use of all of the hotel's facilities, including the wellness area with sauna, the gym, free ski bus to the piste which stops right outside the front door in winter, a wonderful restaurant, which serves a great breakfast, lunch and dinner, and the apartment cleaning service (all extras can be arranged and paid for upon arrival). Even your ski rental, ski lessons and ski pass in winter, or your bike rental in summer, can be arranged at the hotel. Your luxury apartment runs along the entire depth of the building and is situated on the 4th floor, which can be reached by lift. The apartment enjoys a high-quality interior and has been furnished with a keen eye for detail. The living room provides direct access to the terrace, has an open kitchen and a nice dining area. You'll have no less than 6 beautifully furnished bedrooms at your disposal. Dachstein West, the largest skiing area in Oberösterreich, offers a total of 142 km of pistes and interconnects the towns of Annaberg, Russbach and Gosau. The area is great for beginners and advanced skiers alike. Would you prefer a different activity? No problem - there are plenty of things to do here, including cross-country skiing, tobogganing, hiking and snow shoe walking. The magnificent natural beauty, and Salzkammergut's lakes surrounded by majestic mountains in particular, come highly recommended in summer, too. Don't miss the opportunity to visit the famous UNESCO town of Hallstatt. Active holidaymakers will love the many hiking and climbing routes. The beautiful Gosausee lake is also worth a visit. Aankomst was prima, moesten ivm drukte wel even wachten. Accommodatie is pas in december opgeleverd en was gelijk volgeboekt voor de daarop volgende weken hierdoor waren wat kleine dingetjes nog niet in orde. Het appartement heeft een fantastisch ligging in het uitgestrekte dorp Gosau. De skibus stopt voor de deur, echter met de auto is het ook goed te doen om naar de piste te rijden. Appartement is van alle gemakken voorzien en lekker ruim. Het skigebied Dachstein West is erg mooi en de pistes zijn zeer breed.